Aspartame – You know what’s in your Diet Soda? When it comes to toxins, I find it pretty amazing what the human body can tolerate. In some cases, it’s mind over matter. In others, it’s simply a matter of time before it catches up with us. In many cases, toxins come in natural forms from many different plant (or animal) based forms. As you remember from my posting on Enzyme inhibitors, toxins can be used as a natural defense that we, as humans, can work around in order to minimize our exposure. When it comes to man-made toxins, there is an emotional element that makes you wonder – why would someone do that? Well, the motivation that drives one person may be completely different from what drives another. In the eyes of big business, it’s quite often money that gets credit as the motivation. Yet, that motivation is something that you can vote on every day. When its money that drives what’s bad, the first step towards removing it (the bad thing) is to not give it money! Thus, like being green, or growing your own veggies, what you buy in the store is a lifestyle choice. You get to choose what you buy and in doing so, you support what ‘they’ do. Aspartame (or APM) (pronounced /ˈæspərteɪm/ or /əˈspɑrteɪm/) is an artificial, non-saccharide sweetener used as a sugar substitute in some foods and beverages. The most notable name brand of aspartame is Nutra-sweet. In the European Union, it is codified as E951. Aspartame is a methyl ester of the aspartic acid/phenylalanine dipeptide. It was first synthesized in 1965. So, what is an excitotoxin? These are substances, usually amino acids, that react with specialized receptors in the brain in such a way as to lead to destruction of certain types of brain cells. Glutamate is one of the more commonly known excitotoxins. MSG is the sodium salt of glutamate. This amino acid is a normal neurotransmitter in the brain. In fact, it is the most commonly used neurotransmitter by the brain. Defenders of MSG and aspartame use, often say: “How could a substance that is used normally by the brain cause harm?” This is because, glutamate, as a neurotransmitter, is used by the brain only in very, very small concentrations – no more than 8 to 12ug. When the concentration of this transmitter rises above this level the neurons begin to fire abnormally. At higher concentrations, the cells undergo a specialized process of cell death. It is a known-fact in the scientific community that methanol (wood alcohol) in aspartame coverts to formaldehyde when the temperature of aspartame exceeds 86 degrees Farenheit. Formaldehyde is grouped in the same class as cyanide and arsenic which are deadly poisons. Formic acid is another bi-product of methanol which is the poison found in the sting of fire ants. The kicker to all this is that this food additive is in many of the foods people commonly eat. You probably didn’t even know it. The additive has a number of different names and can be classified as a hidden ingredient like “Yeast extract.” That’s probably why Doritos chips are so darn exciting! Ah, maybe not. Looks like they just have an extremely high MSG level! Lol. When it comes to MSG, which has also been around a while, and is in the same class of neurotoxins as Aspartame, you find that people have gone to great lengths to disguise the names. Here are some common sources. Why all the fuss? Well, it all really comes down to how you want to live your life. You get to make the lifestyle choices that help foster the life that you want to live. More specifically, if you don’t consciously choose what you consume someone else will do it for you and their motives may not be in line with yours! If you have an extra 90 minutes, this Youtube video will give you a good introduction to the issues related to Aspartame. If the above video doesn’t come through correctly, this link may just do the trick. I have to say that stuff like this really makes it easier to want to consume unprocessed fruits, veggies, seeds and nuts rather than the standard processed and prepared foods. As homework, perform a Google search and find some testimonials regarding people’s experiences that they willingly share. If the search brings up doctors comments about Aspartame, look to see if they have any actual experience treating (curing) someone that figured out Aspartame was personally bad for them. If they don’t have experience, simply keep looking. There are lots of articles where people outline their experience that is a firsthand account of their experience. The last time I searched for Aspartame dangers I got 76k hits. Aspartame poisoning, I received nearly 40k hits, Aspartame cancer, you’ll get 641k hits. That’s a lot of public information that will give you the idea that there are a lot of people that are truly concerned about this substance and they want you to be aware of it too. Last note: There is no need to fear Aspartame. In small amounts, it only does a little damage. All things being relative, if you consciously reduce your intake of Aspartame, you’ll probably find that there is something else that you’re consuming that has a bigger influence than the Aspartame that you can’t remove. Life is about experiences, if you filter out what other people want you to experience, you get a bit closer to what YOU want to experience. The human body, mind and spirit can overcome a lot! Make your conscious decisions and go on enjoying your life and sharing your happiness with others! I have to admit that I’ve thought about that nasty six letter word, for it seems to step into people’s lives and turn them upside down to shake out every penny. It turns out that nearly every time that someone gets diagnosed, they believe the bad news from their doctor and that person’s aura immediately flips being life filled to one of death. When you walk out of your doctor’s office, I wonder if he’s thinking about the color of his next BMW? Radiation treatment is NOT the answer. Giving up organs is not the answer. I might be a little different, but when I’ve thought about Cancer it’s always been with defensive thoughts. It’s like forming a game plan as an alternative to what has become known as the standard cancer treatments (not cures mind you). It’s like saying, if I was next for that life lesion, what would I do? It’s like thinking about how you’d feed your family if the stores all closed down. It’s like figuring out how to stay warm if the power goes out for days. It’s like figuring out what your next job will be considering and leveraging you weaknesses and strengths. I might need to qualify this a little because I’ve always taken the stand that you’ve got to take care of yourself. Your body is your temple and you can’t rely on anyone else fixing you. You have to do it yourself. I believe firmly that your body heals itself – It knows what to do – It fixes broken bones (the doctors my set it, but the body fixes it) – it heals wounds (the doctors my sow you back together, but the body heals it) – it maintains standard function (digestion, heartbeat, energy production and whatnot) – All we have to do is stop defiling the temple so the body can simply do what it does! Implement what rings true as the way to allow the body to heal. I would give it 100% of my concentration so as to maximize the healing process. If you think about how you help heal a cut, the simple things are to keep it clean and dry so the body can perform its work. If you take the approach to continually stretch it open, you’ll find the healing will, ultimately, take a long time to correct the wound. Implementation is key. As a general observer, and thinker, there are some common items that seem to come together from survivor’s testimonials that may be key to helping the body heal. Detoxify the body. There are hundreds of books written on this topic, but what it all really comes down to is you’ve got to help streamline the process of elimination. Colonics are a must. Fiber is a must. Dietary changes that reduce mucus is a must. Measure and balance the body pH. It has been shown over and over again that cancer cells grow in acid conditions. Change the body so the pH is more neutral. It’s a really simple chemistry, but if you don’t actively measure, you’ll never know what makes acid and what counters it. Consume living (live) food! Enzymes are the tools that the body uses to build and maintain just about everything. If you don’t consume enzymes – your body will have to make them. This takes time and energy that can be replaced by simply consuming them in natural forms. Laugh, or find a reason to live! If you simply don’t care, then you’ll just keep doing what you did that got your body into the situation in which it’s in. Most importantly, you have to be able to get the ego aside and realize that what you’ve been doing up to now has led you to where you are. If you like where you’re at, then what you’ve been doing is working for you. If you Do NOT like where you are, than you have to come to the realization that you’ve been doing it wrong which produced the person you are today. I have believed for a long time now that cancer is the result of a lifestyle and that lifestyles can be changed. Hopefully, you’ll never be forced to have to change your lifestyle! May you enjoy the electric excitement of life’s abundance! PS. I’d probably go to the Hippocrates Health Institute for 30+ days as a primer for changing my life. I can’t believe it took me this long to think of making home make coconut milk! Almond milk is so common and nearly everyone learns to make that right off the bat, but coconut milk isn’t usually on the list. I mean, I’ve been making sesame milk for a long time, but the thought of coconut milk just never seemed to grip hold. That all changed the other day when shopping at Wholefoods. I’ve been buying small bags of shredded coconut for different deserts and it dawned on me that they also sell flakes in the bulk section. Turns out, dried coconut flakes are pretty cheap. It was at that same moment, that the thought of making the flakes into coconut milk hit me. Thus, into the blender it went! I followed the standard rule 1 part nut to 3 parts water and let it whirl. What came out was warm coconut milk. As I said, 1 cup flakes to 3 cups water. I used just a little more here so that I’d get a full quart full. After blending for nearly two minutes, just when I could feel a little heat on the side of the blender, I poured it into a nut milk bag. I’ve got a nice measuring bowl that fits the nut milk bag perfectly. I work the bag over the bowl so that just one corner of the bag sits on the bottom of the bowl. Thus, when I pour in the unfiltered milk, the top half of the bag stays nice and dry. 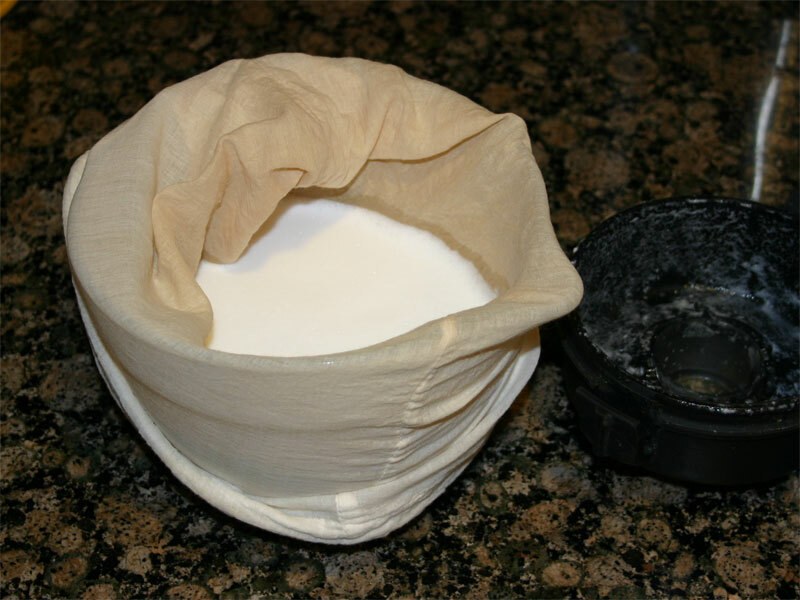 After lifting the bag, so that I can gently press out the liquid, the bowl go from a frame for the nut milk bag to the receptor of the milk. 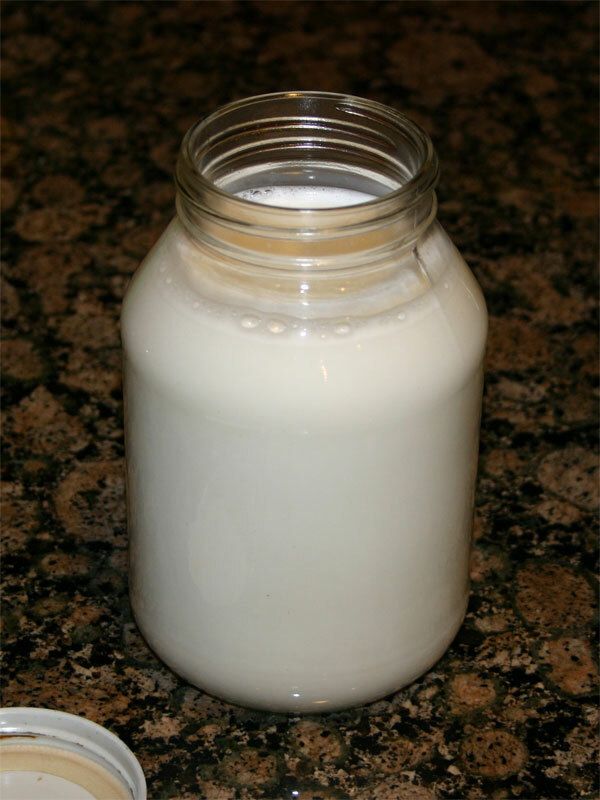 After cleaning out the bag, I poured the milk into a quart jar so it can go straight into the fridge. With luck, the oils will congeal on the top of the quart. 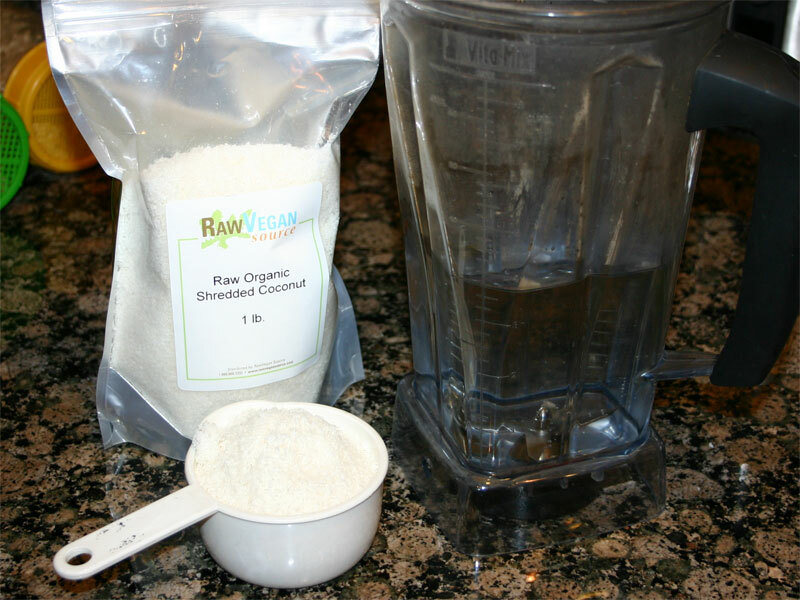 That oil, along with the milk, makes for a great addition to a green smoothie! Remember, as you saw in my A Warming Experiment article, oil is a good thing! Oil provides a ‘fuel’ that helps keep the body warmer longer. In the case of adding this to a green smoothie, it offsets the cooling properties with a little bit of warming. Give it a try. I’m sure you’ll enjoy it also! I keep finding myself coming around to this statement written by Will Johnson in his book The Posture of Meditation. Sensation and involuntary thought cannot occupy the same space simultaneously. My experiences have shown this to be a truthful statement. Involuntary thought, as Without intention; unintentional (thank you wikipedia) always seem to overpower all other senses. It’s as if the act of thinking triggers so many sensors in the body that all the triggers from other sources get overwhelmed in the process. Getting control of involuntary thought – through relaxation – works like a charm. It is the fastest way to heighten all your senses and, at the same time, bring your life into the present. In the present moment is where the sensation of life exists, don’t let it get overrun by unintentional thought. How do you tackle this unintentional thought? Relaxation is the function of the body’s ability to surrender its weight to the pull of gravity. Well, the act of relaxing is the result of calming the mind. How many times have you heard/read someone say something like ‘when you meditate, you still your mind’ or ‘think of nothing but your breathing when you meditate.’ As it turns out, the process of thinking generates electromagnetic currents that directly influence the body which responds with tension. It’s a natural bio-feedback loop; when you feel tense, it’s a direct reflection of a thought. Likewise, if you are thinking, you will be tense. By locking our body into patterns of tension and rigidity, we become numb to our sensations and feelings. Next time you meditate, make a conscious effort to become totally relaxed in a position that defies gravity (sitting upright). As thoughts give way and relaxation is experienced, your senses will become hypersensitive! The smallest activity around you will register, via your senses, as if it’s part of you. For instance, if you are a student of yoga, during the relaxation process at the very end of class, if you truly become relaxed, you’ll notice that the smallest whisper of sound will register as if it’s the full voice that booms through you. Or, if you mediate alone, you might notice that the slightest noise in the house bowls you over. This is exactly what you want to experience when you mediate. That is the heightened sense of awareness that shows your involuntary thought is not overpowering your experience of life. A body that can align itself with gravity and then relax through surrendering its weight to the pull of gravity activates an awareness of its tactile, sensational presence. This presence, then, becomes a force that itself can purity the body and mind and reveal the meditative awarenesses that are the goal of the practice. Consider the classic anxiety attack where difficult thoughts roll through you mind over and over again paralyzing the body and blinding all other senses to the activities that should be performed in the current moment. Tossing and turning at night with thoughts rolling through your head is a perfect example where conscious relaxation should be practiced. The activity of the moment should be sleep, yet the thoughts create too much tension to even consider it. Making conscious choices to stay balanced will help with experiencing what your senses have to share. If a deep breath moves you a step towards immediate relaxation, maybe two will be better. At the same time, the tension can act to contract the body. Make it egg-shaped. By holding and identifying with thoughts, you invite limitation into your experience and interfere with the passage of the life force just as effectively as if you were holding back on sensations. Who you think you are and how you think you should behave shape the tension in your body resulting in an experience from a tainted point of view. The ego plays a part in how you perceive the world. If you think you should behave a particular way during a life event, the information that your senses receive will be hardened or realized based on your expectations. It’s like the quantum physics concept of the observer changing the experiment by the simple act of observing. Many somatic therapists are being drawn to the notion that the location for what we call the “unconscious” is to be found in the tissues of the body itself, not just in some corner of the brain. If this is so, then as we become increasingly conscious of sensations, we are literally bringing our unconscious to the surface of awareness where it can once again be liberated and included as part of the conscious sphere of our body and mind. The body is the repository of the unconscious only so long as we remain unconscious of the body. My studies all seem to lead to the same place – we are light Beings that are graced with the ability to experience sensations through our bodies. As we relax and shake the tension that shapes who we think we need to be, we start to experience life. The unconscious activities that we normally take for granted become heightened if that same activity is approached when we are actively tension free (relaxed). This involves a conscious decision to let go of unconscious thought and embrace the sensations of the current moment. At this point, it’s a matter of acting rather than studying. The commitment to experience life to its fullest is a commitment to not carrying around the tension of idle thoughts. Feel all that you can without hesitation. Life is before you to enjoy.